On the first Saturday of each month (except January and August) we run four-hour workshops in association with Sage Gateshead. Each one is different, and is usually facilitated by a different tutor. The tutors this time is internationally acclaimed saxophonist, teacher and composer Julian Costello, who runs the jazz school at Richmond Adult and Community College, and guitarist and composer Maciek Pysz. 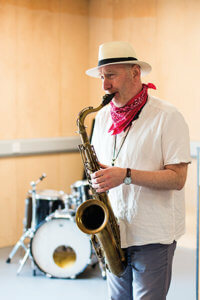 The Julian Costello Quartet will be playing a gig at The Globe in the evening. The workshop will focus first on modal improvisation, including using space and band communication skills, taking the Miles Davis / Bill Evans composition Flamenco Sketches as an example. Then it will look at the Lydian mode and II-V-I progression using Victor Young’s Stella by Starlight (famously recorded by Miles Davis) as an example. want to meet and play with other jazz musicians. You will work in a small group led by an experienced jazz musician. You’ll learn a bit of theory but mostly it will be practical – lots of listening and playing. You’ll have the opportunity to improvise and interact with other musicians in an informal supportive situation. Suitable for all instruments and improvising vocalists. Minimum age 16. Each four-hour workshop costs £20 (or £18 for Jazz.Coop members). Ticket sales are handled by the Sage and there’s a £1.50 booking fee for online and telephone sales (but not if you pay cash at the ticket office).